A Fleetwood man drove with drugs in his system a court decided. David Hawkes, 52, of Broadway, denied driving a Nissan Micra on Peel Road, Fleetwood, on March 4 while unfit through drugs but he was found guilty of the offence by Blackpool magistrates after a trial. He was sentenced to 12 weeks imprisonment suspended for 18 months with up to 30 days rehabilitation to be supervised by the probation service, banned from driving for 48 months and ordered to pay £200 costs with £80 victims’ surcharge. • A man was unable to attend court because he was ill.
Peter Bandy, 41, of Salisbury Avenue, Knott End, who is accused of being drunk and disorderly had his case adjourned. • A drunken driver seriously injured a pedestrian while committing his third offence of driving with excess alcohol. Christopher Pawson collided with a man walking along Tithebarn Street, Poulton, after losing control of his car one afternoon when he was two-and-a-half times over the limit. Pawson, a 28-year-old joiner, of Mains Lane, Blackpool, pleaded guilty to drink-driving. 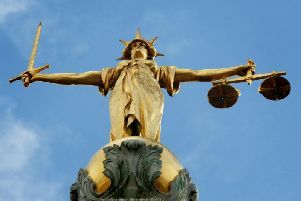 He was sentenced to a 12 months community order, told to do 100 hours unpaid work for the community, disqualified from driving for 40 months and ordered to pay £85 costs with £60 victims’ surcharge by Blackpool magistrates. The court was told that on January 16 about 4.30pm Pawson was driving a Fiat Punto in Poulton when he collided with a pedestrian on the pavement, knocking him down an embankment. Police smelt alcohol on his breath at the accident scene and a breath test showed he had 56 micrograms of alcohol in his body - 35 is the limit. Stephen Duffy, defending, said the day of the accident there had been torrential rain and it then turned very cold. Water tended to pool on that road and Pawson did not know whether his car skidded on ice or hydroplaned. Pawson had tended to the victim and called an ambulance. At the police station his thoughts were not for himself but only for the accident victim and he repeatedly asked about his injuries and welfare. He had now written the victim a letter. Pawson had suffered from depression previously, been prescribed anti-depressants and gone to Alcoholics Anonymous. In a report to the court, probation officer Lesley Whittaker, said the day of the offence Pawson had drunk two cans and two bottles of lager. He had arranged a night out in Manchester and was on his way to the train station. He said he had felt fit to drive.